The Living Odyssey Project: Greek Myth in 21st Century American Folklore is a reception study that identifies aspects of the Odysseus myth in modern American oral and popular culture. It straddles the divide between humanities and social science by using ethnographic field methodology to examine classical myth. In order to isolate knowledge of the modern myth from knowledge of the ancient Homeric epic, project surveys children in the 5th through the 8th. The goal of the study is to substantiate the existence of an American folklore tradition of the myth Odysseus separate from the ancient Greek epic, Homer's Odyssey. Dr. Krishni Burns and a team of undergraduate students led by undergraduate honors student Samantha Lindgren will be conducting ethnographic research through survey. The survey will produce a large body of descriptive quantitative data that will allow the team to define the shape of the modern myth, as opposed to the ancient text, within the Great Lakes region. 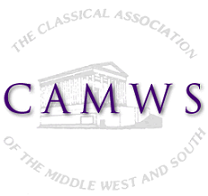 Results will be reported at a round table at the 2018 annual meeting at CAMWS, pending approval, and at an intercollegiate workshop held at the University of Illinois at Urbana-Champaign in May of 2018.